I’ve mentioned Johore Tin a few times before and the company indeed never failed to deliver what I’ve expected but in fact even went beyond what I anticipated (Please click here for my previous posts). Johore Tin just announced its quarterly results few days back and I was pleasantly surprised by its strong performance during the quarter. I expected a profit of RM18mil earlier for the whole year of FY12 but now its 9MFY12 net profit was already at RM16.7mil. 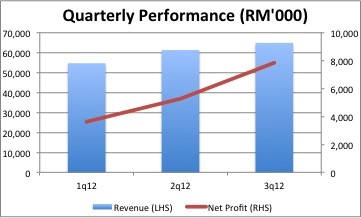 During 3QFY12, net profit rose 48.4% qoq to RM7.8mil. Revenue rose 5.9% to RM64.7mil. Net margin expanded substantially to 12% from 8.6% in 2QFY12. The main drivers for the good performance were lower material prices which boosted margins in tin can manufacturing coupled with stronger sales of its dairy products. 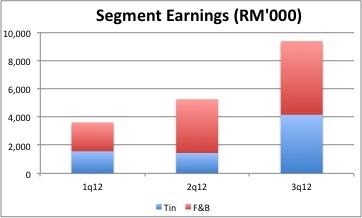 Tin can manufacturing earnings rose substantially qoq to RM4.2mil, accounting for 44% of earnings for the quarter. Its F&B division registered a 37% qoq rise in earnings to RM5.2mil on the back of 17% qoq increase in revenue to RM46.9mil, accounting for the remaining 56% of the company’s earnings. Going forward, raw material prices are expected to decrease in the near term according to management. Thus, tin can manufacturing could continue to benefit from it. Having said that, margins for tin can manufacturing could normalize again as the cost savings will be passed on to customers. As for F&B, demand for dairy products will continue to remain firm which will result in higher sales and profits. Valuation: Assuming another RM5mil net profit for 4QFY12, total earnings for FY12 could reach RM21.7mil, thus PER for FY12 would be at PER of 6.6x. OSK currently has an earnings estimate of RM25.5mil for FY13 which I think is easily achievable. Thus, forward PER for FY13 is just at 5.6x. Where do you get PER of less than 6x for a growing consumer stock??? I can’t find any, perhaps this is the cheapest F&B stock I can get from KLSE!! Compare this with Nestle (PER 30x), Dutch Lady (PER 26x) and Mamee (delisted at PER 13-14x). ‘Cbox’ me if you find anything cheaper. By attaching PER of 8-10x, this stock should be valued at RM2.20-RM2.73. Dividend yield will likely be around 4-5% based on its historical dividend payout. Acquisition of land: The company just purchased a land worth RM5.8mil situated in Kuala Langat, Selangor for the construction of warehouse and factory with a combined built-up area of 100k sqft coupled with an office building with built-up area of 4,500 sqft. The land is expected to free up the needed working space of Able Dairies' facility and allow the Able Dairies to include additional milk canning line which could increase production capacity by 25%. This facility will also help the company to save RM0.2mil rental as the company is renting warehouses to store its raw materials and finished products. Warrant: Exercise price for its warrant is RM2.28 which will be expired in 5 years. The exercise price set at such a high price at a premium of 43.4% to current price (RM1.59). This probably reflects the confidence of the management towards the company's prospects and the fair value for the company's shares which should likely be higher than RM2.28. It is worth noting that the major shareholders who are also directors of the company coupled with Able Dairies' director, Ng Keng Hoe, have been purchasing the company's shares over the past few weeks. The company is also planning expansion plans to increase capacity by 10% over the next 6 months and potentially up to 30%. In addition, the company is seeking to enter Myanmar which has huge growth potential. 95% of Able Dairies products are exported to Africa, Mideast and other poorer SEA countries where their people likely can't afford milk which had multiplied in prices over the past few years (200% rise). Condensed milk probably moved up 30% only over the past 5 years. Able Dairies is pretty much the same as Can-One's F&B as Can-One's F&B also manufactures sweetened condensed milk and evaporated milk which are exported to the same countries. Can-One's venture into this F&B had yielded good profits over the past few years and I expect Johore Tin to follow suit. Great analysis. Most corporate acquisitions are value destroyers, but for Johore Tin's acquisition of Able Dairies is a rare exception. Margins actually improved and operation efficiencies jumped by leaps and bounds. If you do a discount cash flows analysis, you will see that the present price of RM1.60 provides a high margin of safety. Good pick. Thanks for the invaluable views. But I have 1 concern - while the dairy products business is doing great (although I have a bit of concern about it due to the profit margin), the tin business is deteriorating for the past few Quarters. In fact, based on the statements of the management this part of the business is expected to slow down even more. How much would that put a damper into the continued growth of the company after these few Quarters of "unusual" growth (arising from the new contributions from Able Dairies)? Johore Tin has evolved to become more of an F&B player than a tin manufacturing. The inter-segmental revenue of tin manufacturing had been increasing over the past few quarters, which I think was due to greater capacity of tin manufacturing being used for Able Dairies' products. Thus we see Able Dairies's margins increasing and less profits for tin manufacturing. From now on, growth will be driven by Able Dairies' expansion plans and new markets e.g. Myanmar etc...I don't expect much from tin manufacturing as more of its capacity will probably be used for Able Dairies' products and its profits from packaging Able Dairies products won't be accounted for. Assuming Johotin will be able to churn out normal growth of 10% rather than the unusual growth arising from new contributions of Able Dairies, Johotin remains cheap with PEG of 0.6x (anything less than 1 for F&B counter is cheap for me) or PER of 6x.